Every year, the change from winter to spring brings millions of Cliff Swallows from Argentina to North America. Since the early 1800s, swallows had returned, year after year, to the Mission of San Juan Capistrano. But during a restoration project in the 1990s, the venerable mud nests were removed from the mission walls, and the birds opted to reside elsewhere in town. Today, a concerted effort is under way to attract the beloved swallows back to the mission. An effort that includes putting up man-made nests. Only time will tell if they return . . .
Every year, the change from winter to spring brings millions of Cliff Swallows northward from Argentina to North America. Some swallows, those that nested in the Mission of San Juan Capistrano, about halfway between Los Angeles and San Diego, were destined for fame. 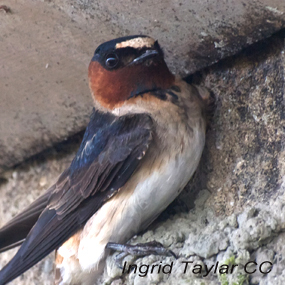 Since the early 1800s, the swallows had returned, year after year, to the same mud nests built high on the stone cathedral walls of the mission. The swallows arrived on or about March 19th, St. Joseph’s Day. So regular was the cycle that, over many years, the Catholic feast of St. Joseph’s Day and the return of the birds became intertwined and were celebrated together. When a catchy song hit the radio airwaves in 1940, nearly everybody came to know the swallows of Capistrano. But today, Cliff Swallows no longer nest at the mission. During a restoration project in the 1990s, the venerable mud nests were removed from the mission walls. Since then the birds have opted to reside elsewhere in town. Now, though, a concerted effort is under way to attract the beloved swallows back to the mission. An effort that includes putting up man-made nests. As to whether the swallows will ever really return, though, only time will tell. Bird sounds provided by The Macaulay Library of Natural Sounds at the Cornell Lab of Ornithology, Ithaca, New York. 111063 Recorded by Thomas G. Sander.